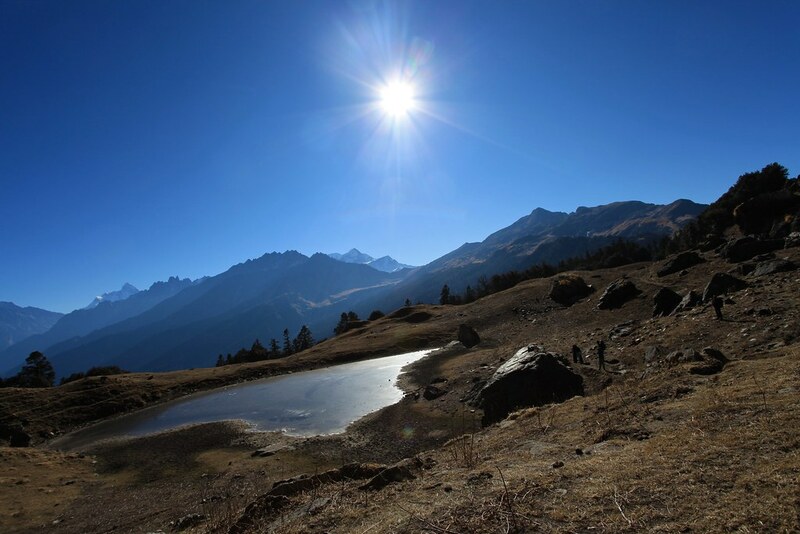 Kuari Pass is a moderate trek in the Indian Himalayas. 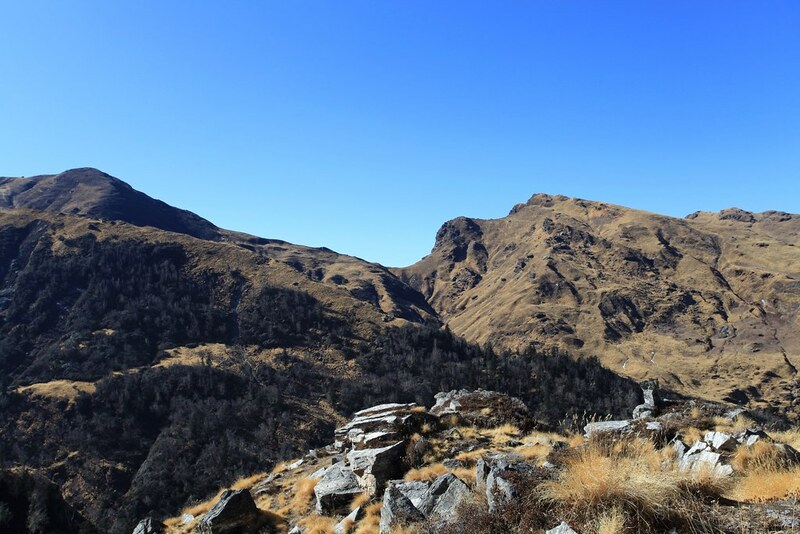 This trek takes place in the mountain passes of Garhwal region of Uttarakhand, India. 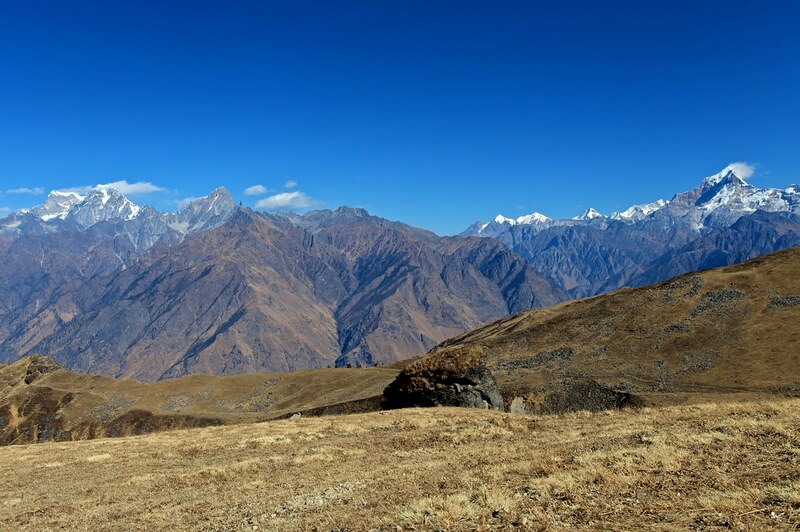 The trek may not be very high altitude per Himalayan standards, but it boasts of some of the most impressive views. 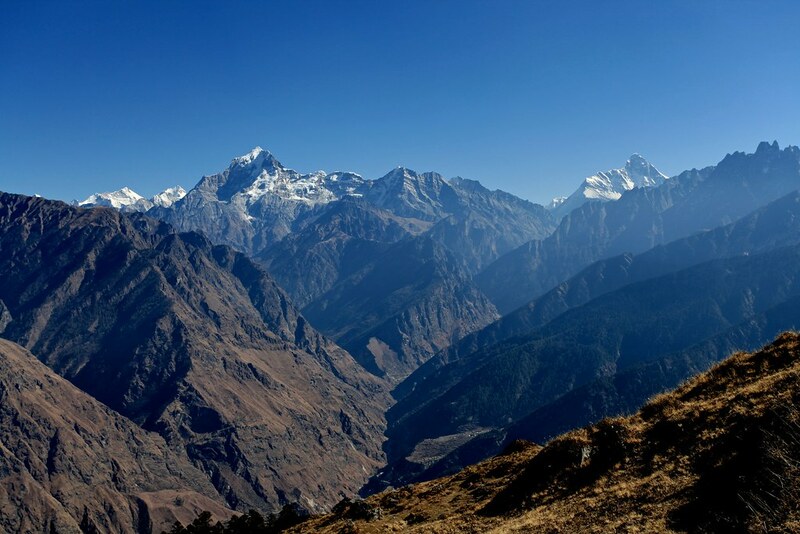 The trek starts from the holy town of Joshimath in Uttarakhand and ends at same place. 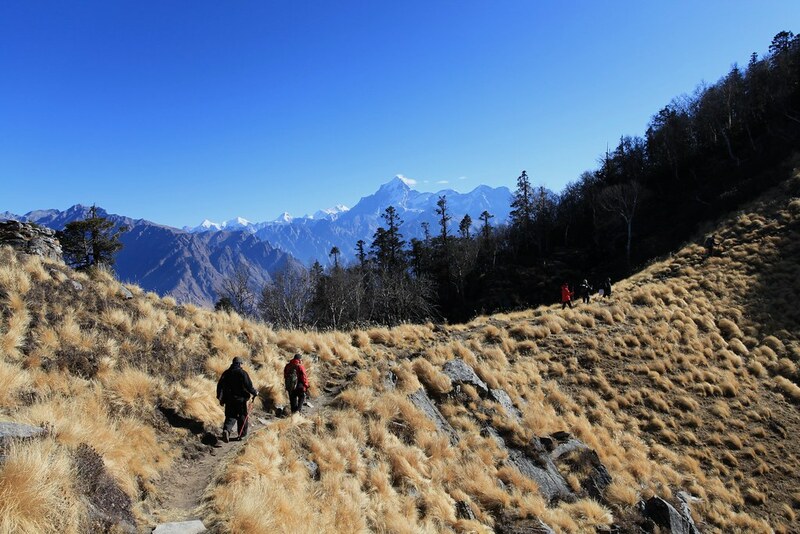 The winter trek takes place for 4 days of trek with wild nature camping in forests and meadows. 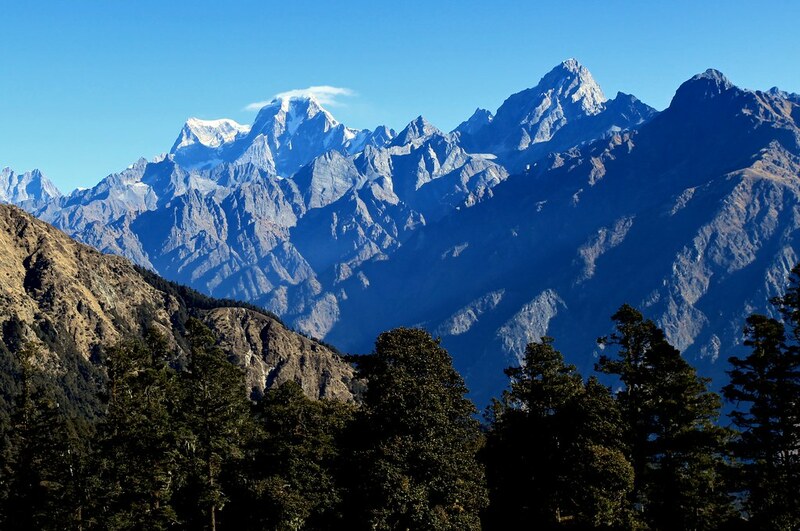 The mighty peaks of Nanda Devi, Drona Giri, Trishul, Nanda Ghunti, Trishuli, Chang Bhang, Kalanka, Hathi Parbat, Gauri Parbat, Mukut, Mana, Neelkantha, Chowkhamba and many other peaks are prominently seen from the trek. 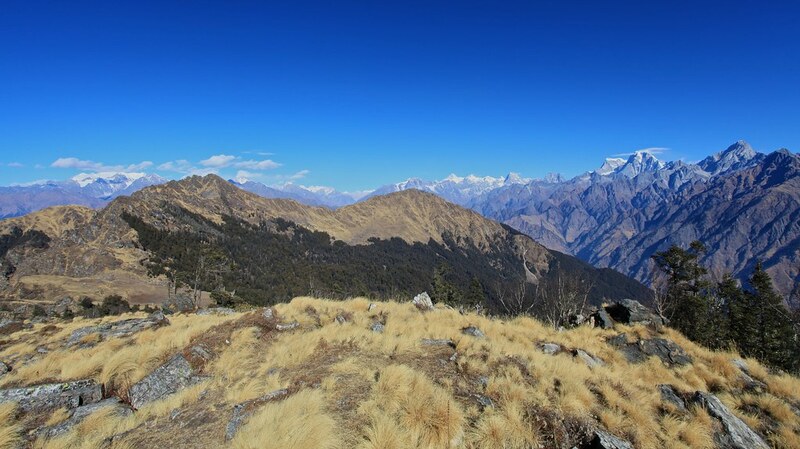 The trek reaches a maximum altitude of 14200 ft above Sea Level at Kuari Top, while the pass is at 13980 ft ASL. The journey started from home in Delhi at 8.30 PM in Dwarka. I took the Reliance Airport Express Metro to New Delhi station and reached there in 20 minutes. After that I changed metro to Rajiv Chowk and again to Anand Vihar ISBT. I finally reached Anand Vihar ISBT at 9.30 PM. The bus for Haridwar will leave at 11.00 PM and costs INR 270. Booked the bus and went to sleep. Woke up at 5 AM when the conductor of the bus told me that I have reached Haridwar. Packed up and went out in cold. Immediately I decided to have a cup of hot tea to warm up the things. Then went to the refreshment facilities in the bus stand and got freshened up. At 6.30 AM the team (5 from Delhi, 2 from Kolkata and 2 from Bangalore) was ready at Haridwar Station for onwards journey. The trek leaders are Sandeep Rawat and Rakesh Pant. We then boarded the Van and started on the day long journey to Joshimath. WE picked up four fellow trekkers from Rishikesh at 8 AM. We stopped at Karnaprayag at 2 PM for lunch. Karnaprayag is a small city in Uttarakhand which lies in the confluence of Alaknanda and Pindar Rivers. The water in winter is clean and beautiful bluish green and with lots of small rapids. Our lunch was beside the backs of Pindar River with beautiful sounds of nature. Soon we proceeded onwards after a good lunch. At around 4 PM we stopped at Pipalkothi for tea break. I found a shop selling local oranges at dirt cheap rates and they tested very well. We had kinno and some other fruits while some guys had tea and fries. We started on the final leg of the journey, when we had a flat tire and wasted almost 30 minutes to fix that. It was getting darker in the valley and we can see the sun going down beyond the hills. At around 5.30 PM we reached Joshimath. We checked into the GMVN. After 1 hour rest we prepared for the next day trek by having a walk in the market. It was nice fun walking the deserted streets of Joshimath in winter evening. At 8.30 PM we had trek briefing by our trek leader Rakesh Pant and then proceeded for last heavy dinner for next few days. We all woke up early at around 5.30 AM and got freshened up with warm shower. After breakfast we were ready to embark on our journey at 8 AM. We did some photo shoots in front of the hotel before embarking on our journey. 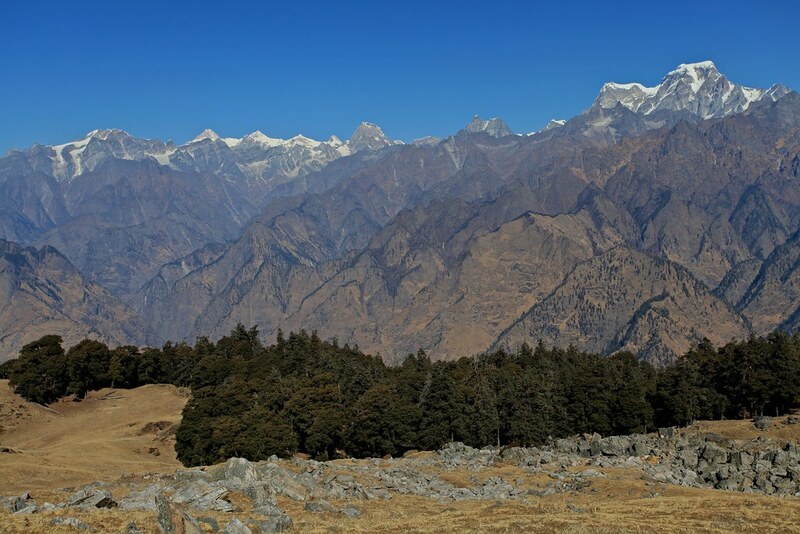 From the GMVN at Joshimath you cannot see any peaks with white snow, cause Joshimath is deep inside the valley. After a 20 minutes’ drive from Joshimath we reached the Dhak Village. 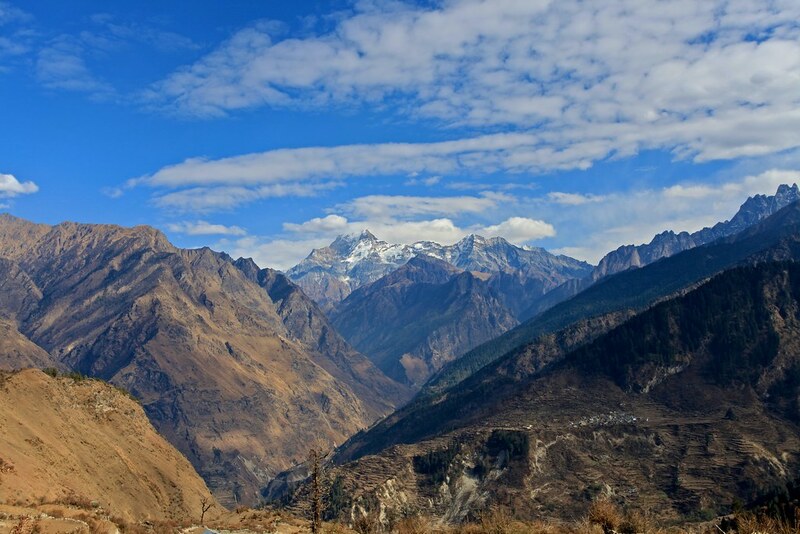 This village is between the Joshimath and Tapovan route. The road head is a start for the trek. We unpacked our luggage and got ourselves ready for the trek. From here the peaks of Drona Giri was very prominent. The hills are barren brown and some are black. There was very little snow in the higher ridges. The weather was clear and bright and ideal to start the trek. 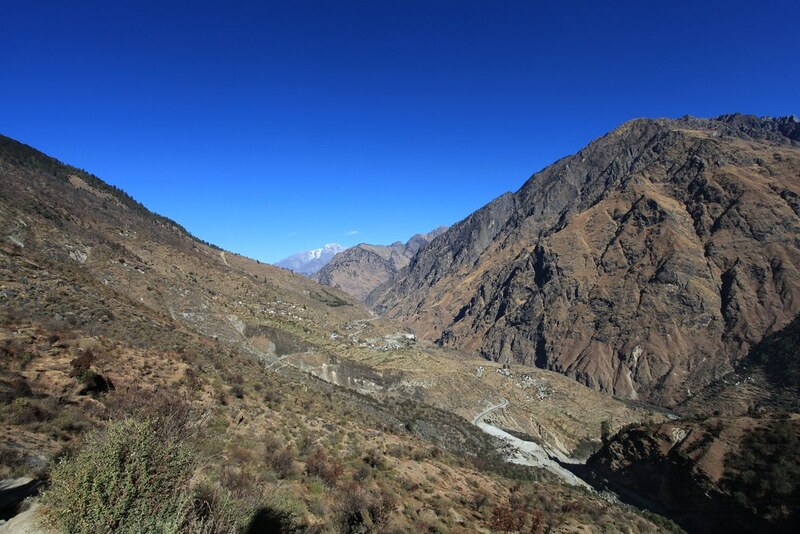 The picture above shows the winding road which is coming from Joshimath which lies behind the hills in the left side. This picture is taken after 30 minutes hike from the road head. The starting point was the white patch of concrete seen in the bottom right of the picture. In the top center of the picture the glaciers on the left side of Kamet Peaks can be seen. This picture is taken looking north. Soon we are moving up the lap of the Himalayas. We moved from one village to another. At around 11 AM we stopped near a stream where we rested. 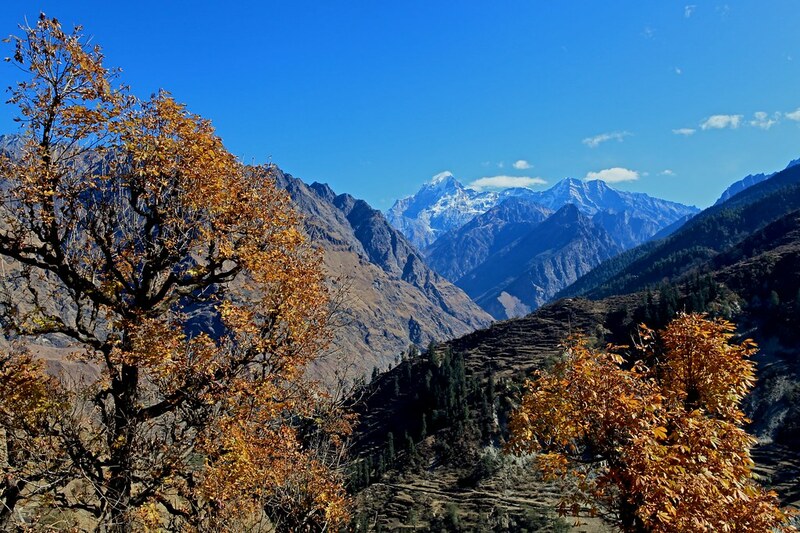 There were a couple of trees which changed colors to golden yellow in late winter and formed a perfect backdrop for capturing the snow peak of Drona Giri. We are now moving up and up. Soon we can see the civilization end below us. We can still see the Vishnugad Tapovan Hydro-power station work going on far below. At around 1 PM we stopped in a meadow for packed lunch. There is a small village just above us and on the left we can see lots of monkeys basking the sun. The picture below is taken from here. The valley in the left is barren brown while the one on the right is dark green for the oak forest. After lunch we started to climb again. We crossed few villages and replenished the water bottles at one of them. We also did some photo-shoot with kids from the village. After that the Oak forest started and it became cooler. The hike through the forest was pleasant. At around 4.30 we reached a prominent clearing on top of the forest. We finally stopped there and camped. 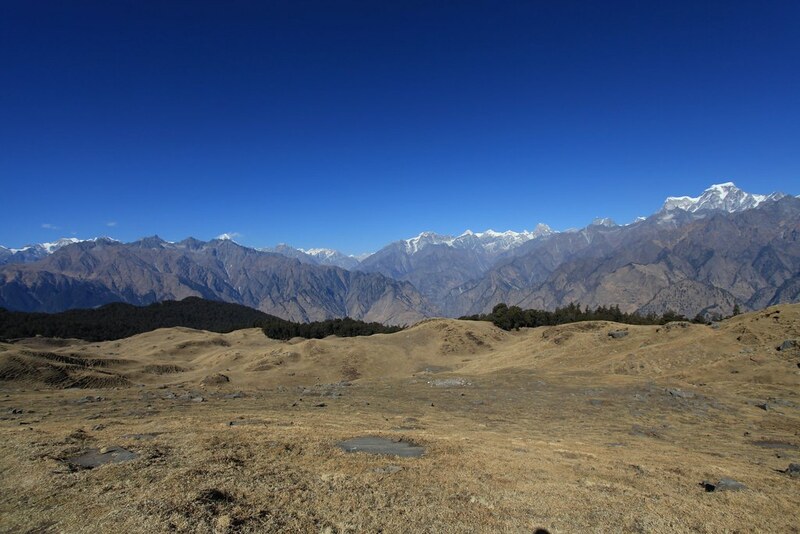 The peaks of Drona Giri and Nanda Devi were prominent from the campsite. 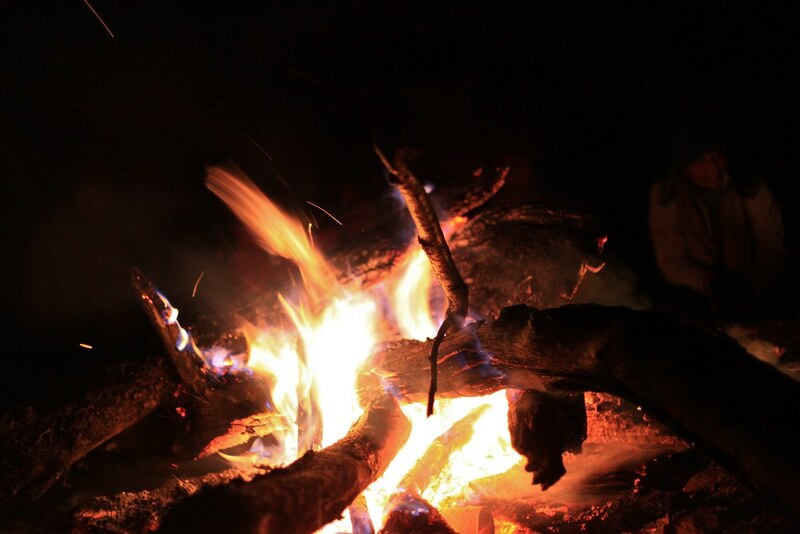 We collected woods and fire was ready for providing the much needed warmth. Everyone was enjoying the amazing sunset in the peaks and we captured the beautiful moments. Soon we were playing games in front of fire. 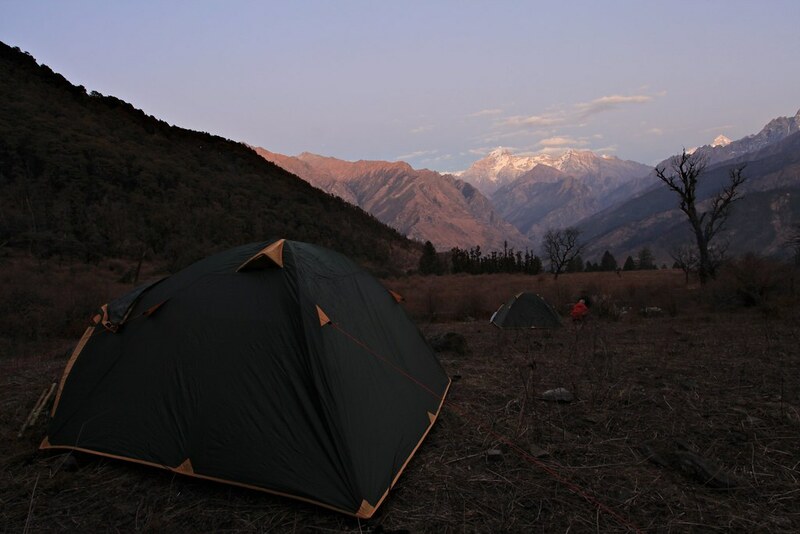 The picture below shows our tents pitched and this shot is taken after sunset. 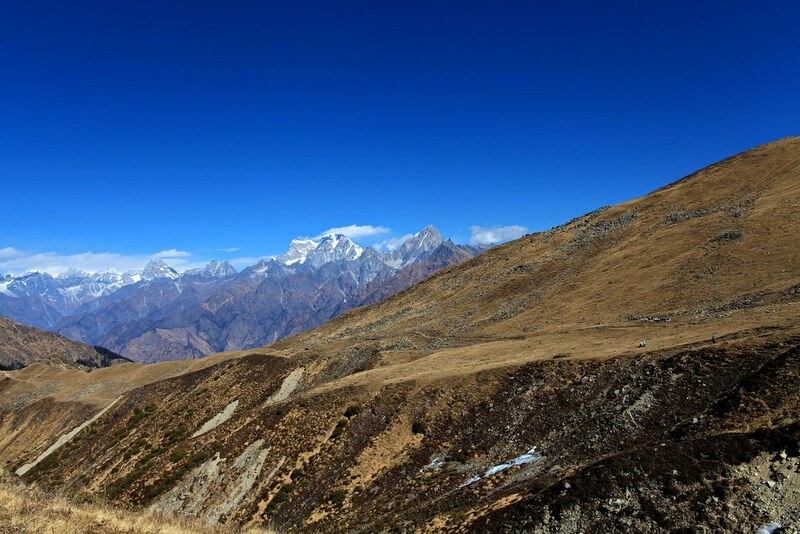 We can see Dronagiri peak in middle and Nanda Devi Peak on the right. At 7.30 PM we had dinner and went to sleep under a clear starry sky. I woke up at 5.30 AM when the air is very cold and the twilight looks awesome. Saw the fire still burning and went straight to it. Soon I was engaged in nice morning chitchat with the porters and discussing about the day ahead. 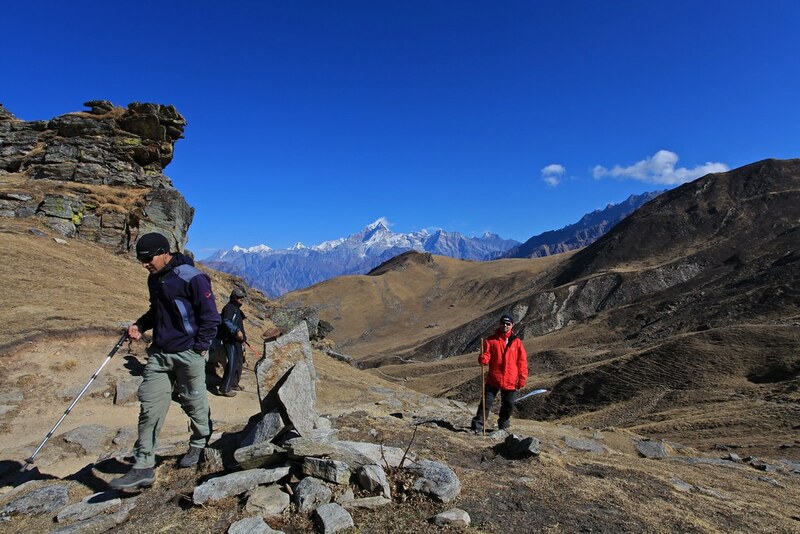 The porters told that the hike for the day is not very long and will take much less time. I was encouraged by the fact that today will be a fun hike. But alas this is not true when Rakesh told me that today is the toughest day of the trek. At 7.30 the sun rays reached our campsite. We all got refreshed and had a hot breakfast. 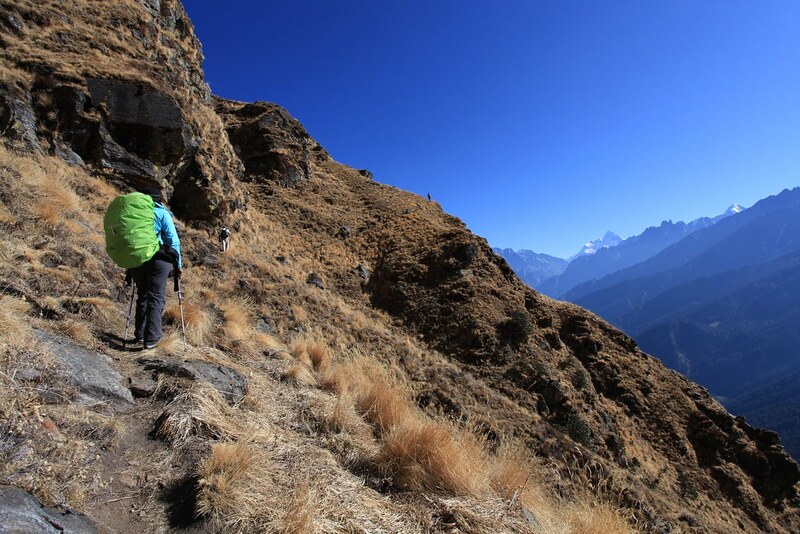 Soon we are ready for the hardest or most strenuous climbing part of the trek. The climb started and soon there was a stop sign due to fatigue. It felt like driving in Delhi with many traffic lights. It went on till 2 PM when we completed the hike and reached Tali Lake. And to sum up the hike was only CLIMB CLIMB and more CLIMB. But when we have pain, we must gain something. The views are simply awesome from the top of Tali Lake. The cold wind blowing and warm sunlight of the winter made us feel better at the Tali Lake Campsite. After such a strenuous hike we all rested on the shores of the Tali Lake for almost an hour. 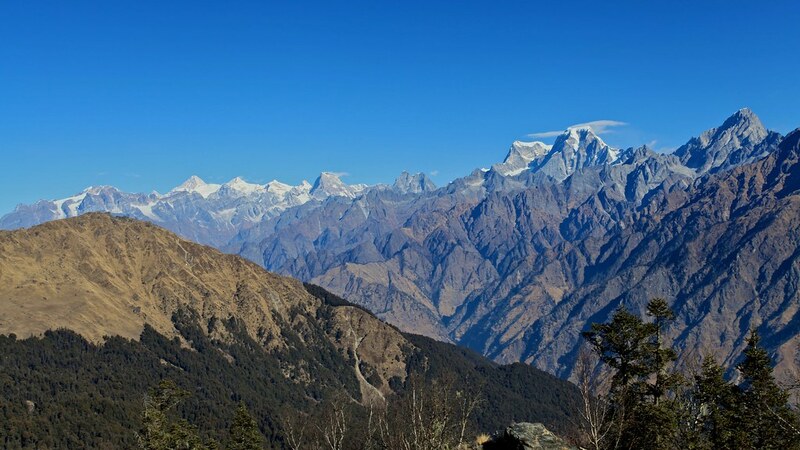 We enjoyed amazing views of Nanda Devi and Dronagiri Peaks in the front, Gauri Parbat, Hathi Parbat, Kamet in the left which is North and Trishul in the South side. Due to fatigue was not in a mood to take out the camera and click some snaps. I just kept watching the beautiful Himalayas in front of me. It really felt good that i did such a strenuous hike for such awesome views. By the way the Tali Lake is completely frozen in winter. The campsite is still few hundred feet downhill in to the forest. But this short walk felt like a marathon run to me. When we finally reached the campsite, it is already getting dark inside the forest and also getting colder. Soon we started arranging firewood’s before it gets dark. The campsite is a beautiful small clearing between the forests with a small stream on one side. We pitched our tents and the campfire was in the middle. 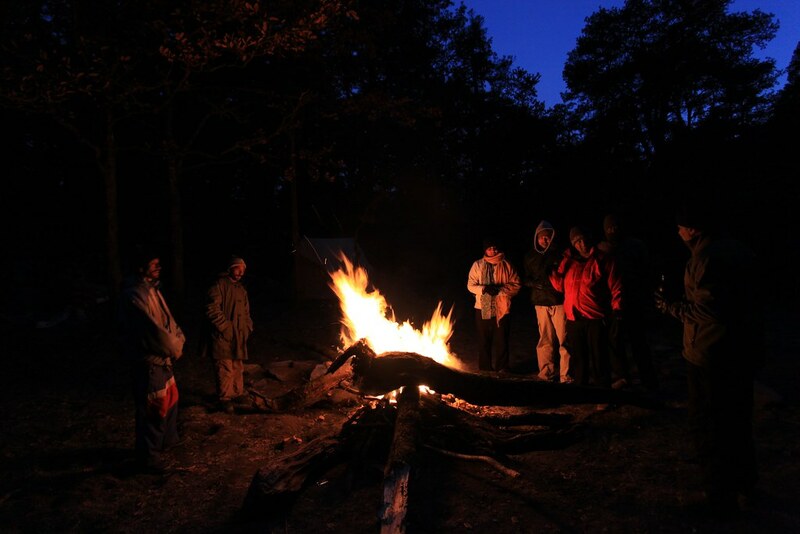 Soon everyone was enjoying the warmth of the fire in the already dark surroundings. At 6 AM i woke up seeing some light outside my tent. I was thirsty and found that i left the bottle outside my sleeping bag and it’s completely frozen. The last time i had water was 3-4 hrs back in pitch dark when i went for natures call. I came out of the tent to find that the fire is still alive and as usual the porters are chatting. By 7 AM most of the trekkers are ready with a hot breakfast already in. I am feeling better today compared to the hard day and the mild fever i had yesterday evening. I still have some headache and so I decided to take a Disprin before i go ahead for the Kuari Pass which will be at much higher altitude. Today will be a long walk and no steep climb. The sun is bright and the weather is clear and warm. 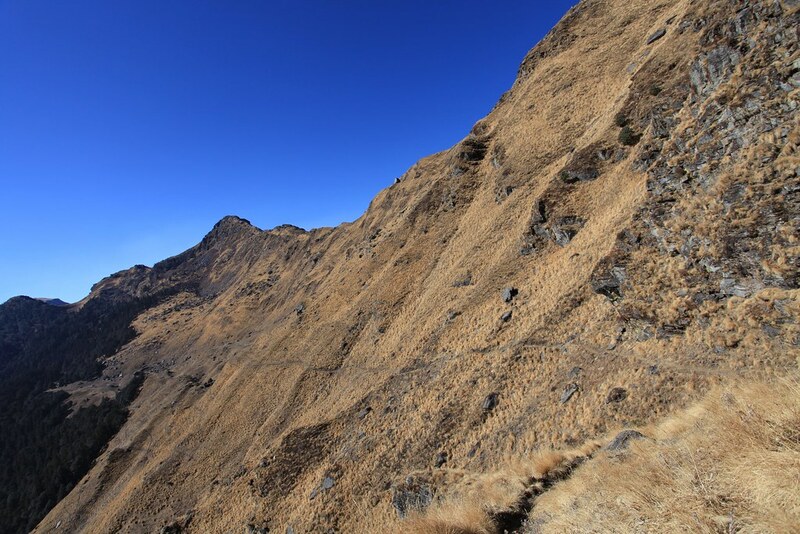 We started the hike to Kuari Pass. 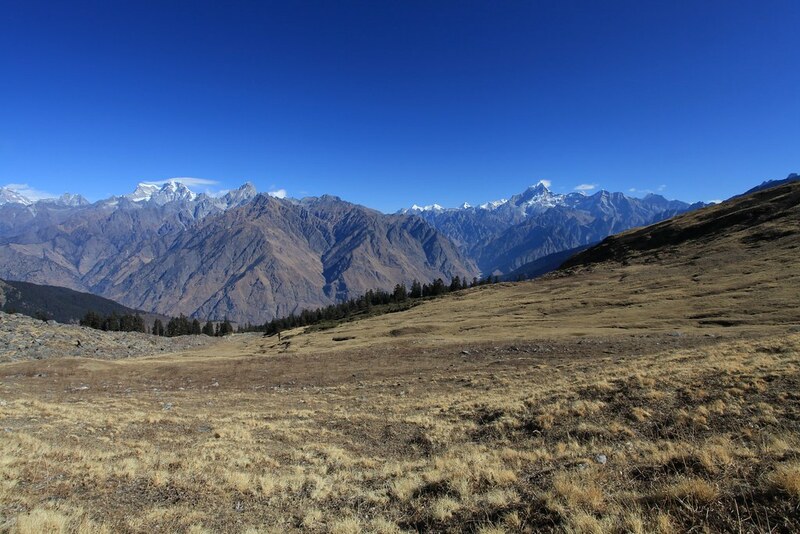 After crossing the jungle which is approximately a kilometer hike up, we reached the meadows of Khullara. The large alpine meadow is like a veil of brown grass now in winter. 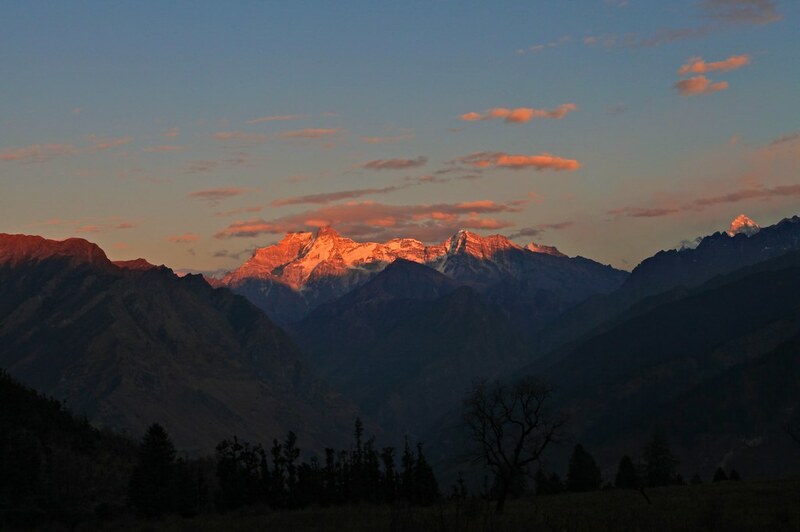 From there the views of Trishul, Nanda Ghunti is prominent. We moved up and down and then we could see Kuari Pass at a distance. The more we hike, the view become more amazing. Seen here is the Kamet Range in the left and Hathi and Gauri Parbat in front. The vast alpine meadow of Khullara is awesome. 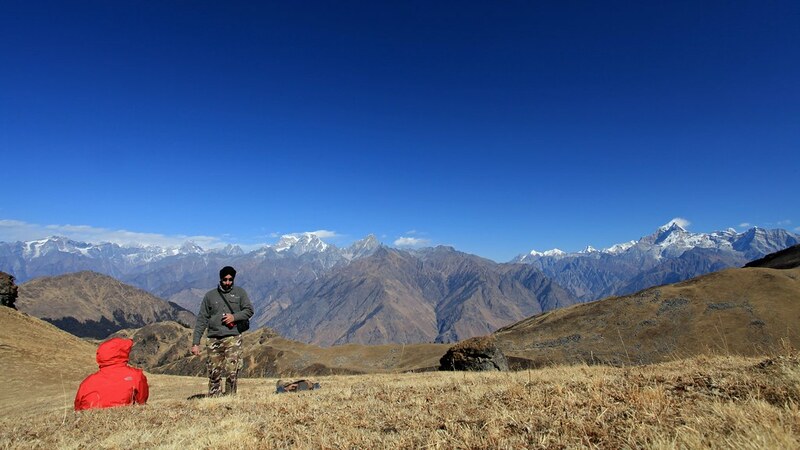 We rested for a while at Khullara top enjoying Himalayas all the way from Nanda Ghunti to Chowkhamba spanning a view of almost 270°. It was really amazing. Now with Kuari Pass in view we felt that the destination is near and can complete in an hour. We continued our journey and then we are below the Pangarchula peak. 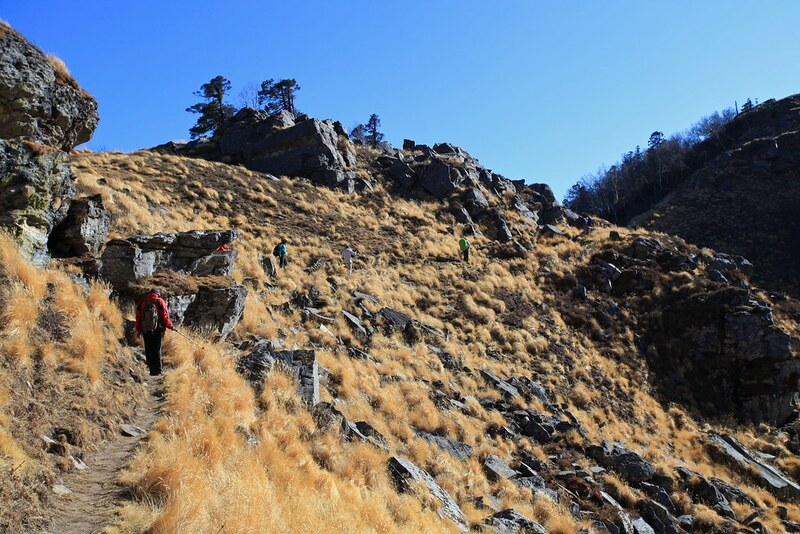 Now the trail divides in two sides’ one going towards Pangarchula Peak and other towards Kuari Pass. As we kept walking we came in front of a frozen stream. The bridge is no more and it can be seen far below. Here we need to cross a river which has frozen to rock hard ice. We decided to go down the river and cross where the ice is not wide. We went down about 50 feet and crossed and climbed back. 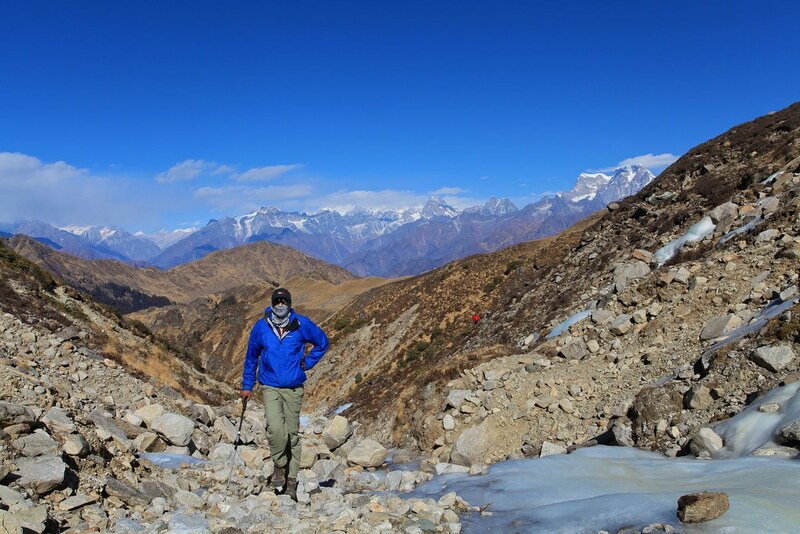 The picture above shows Rakesh after crossing the stream and another trekker coming down for the stream. Now Kuari is stone’s throw away. 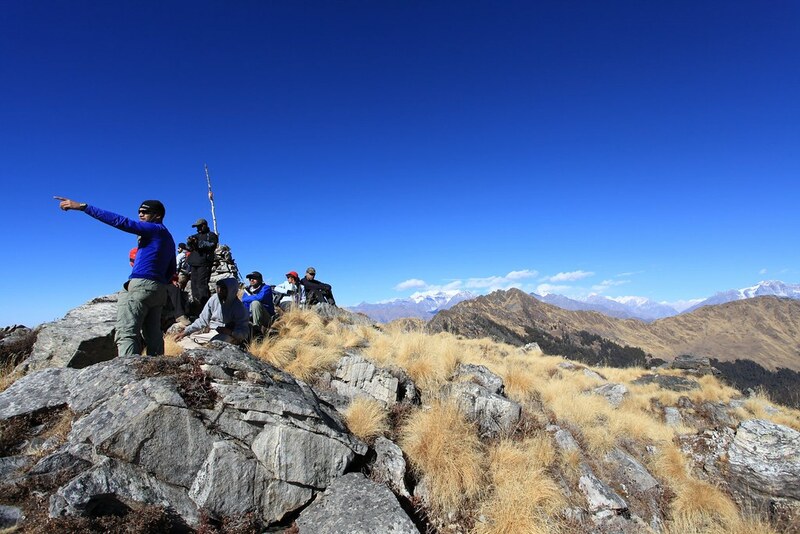 At 1 PM we are sitting on top of Kuari Pass. The feeling is just awesome. We just lay down and enjoyed the views. Oh now it feels great to have completed the trek all the way up here. The views are mesmerizing. After half an hour we started climbing down. We took the hard way to cross the river. The portion of the river where we crossed the ice, the zone was a rocky landslide one. It felt really scary to cross this particular stretch. Rakesh and Sandeep did an excellent job in getting all of us do this stretch in style. Then at 2 PM we are at meadows below for lunch. After eating hot khichdi we started walking back to the campsite. It was fun but it was getting very cold with wind chill biting us sharply. We finally reached campsite at 4.30 PM and took rest for the day. During evening we were playing games and enjoying the success. 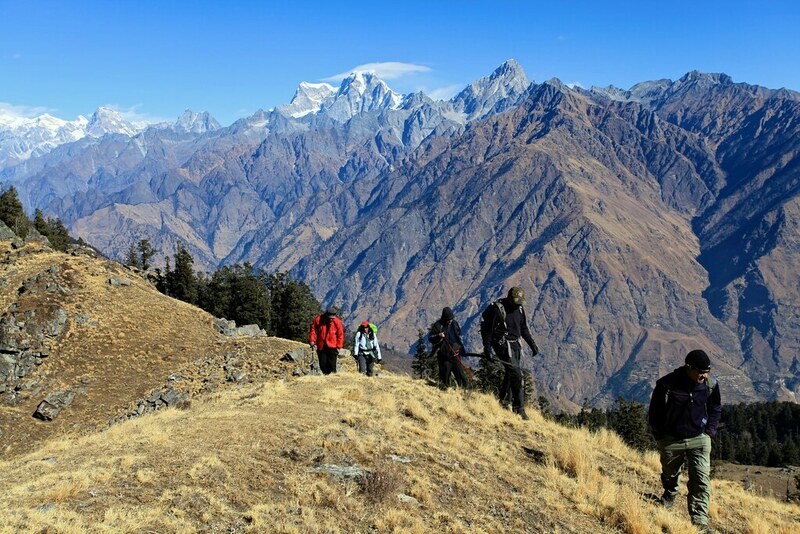 Tomorrow is going to be a long walk back to Auli. We started early at 8 AM after breakfast and soon reached Tali Lake. I was thinking why this short hike today was so difficult 2 days back when it was a decent. We to a photo break at Tali Lake. Lots and Lots of clicks and people tried walking on the hard ice. The sun is shining bright above us. Now we are climbing and traversing the hill via a 1 feet trail with a sheer 300 feet fall on one side and a high wall on the other side. The track is scary in some portion. But we all enjoyed and had fun. After a couple of hours we reached the turnabout and now we can see Gorson Bugyal with the peaks of Mukut and Kamet in front of us. At 1 PM we stopped for lunch at windy and chilly and windy Gorson Bugyal. We had lunch in the Bugyal. After that we stared down towards to forest below. Just before the forest we could see tourist moving around signs of civilization is around. The trail is marked with garbage and plastic covers. 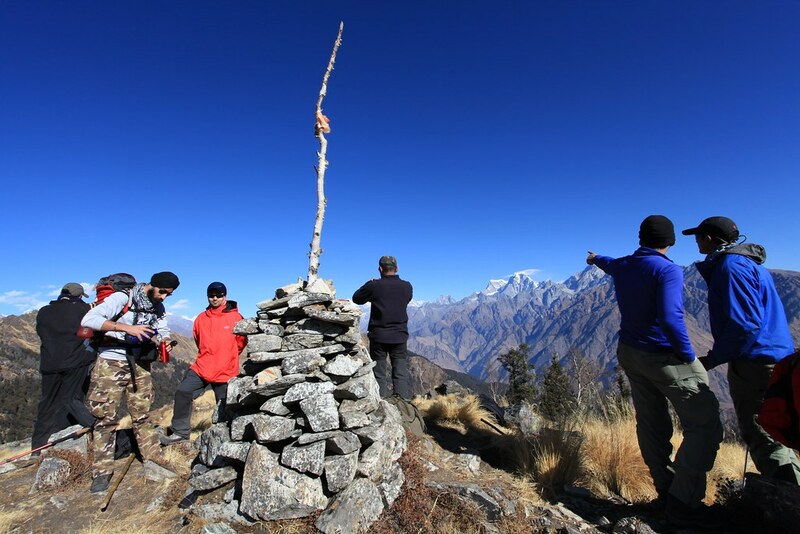 After stopping at the temple in the forest we reached Auli and then to the car waiting for us below. 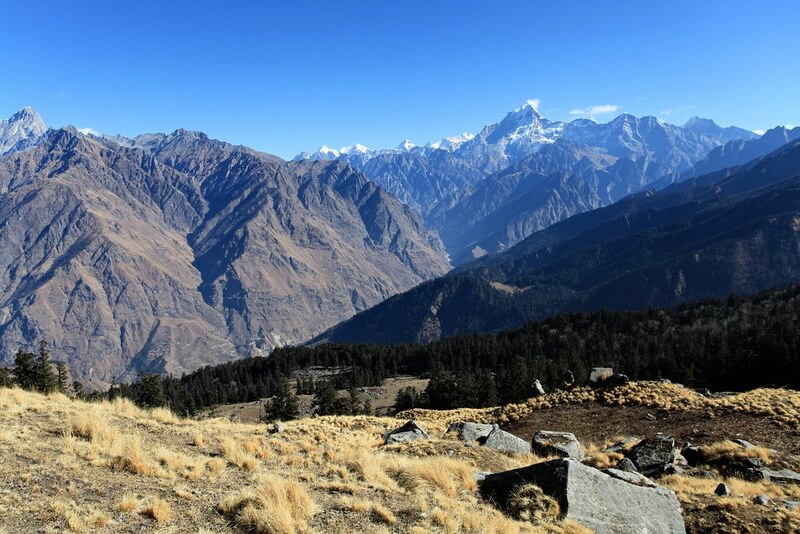 It was a long and tiring day for us all the way from Tali Lake campsite to Auli, but finally we made it. After reaching the hotel we took hot shower and enjoyed the dinner and went to sleep. We started early at 8 AM and finally reached Haridwar at 7 PM. After that we took bus to get back to Delhi. End of the awesome road trip.